November 9, 2015, Queens, NY You can call the fighter Tim or Timmy. You can call the trainer Ted or Teddy. As a duo, you can call them Tim and Ted or Timmy and Teddy. This is somewhat premature, but you may be getting ready to witness one of the great pairings in boxing history. 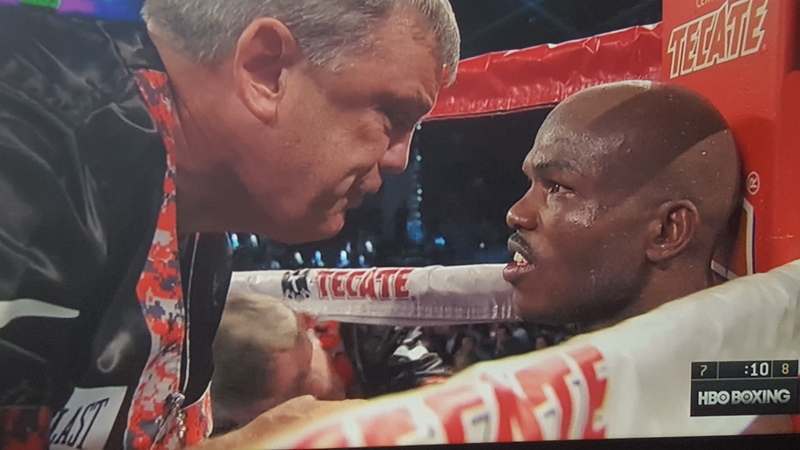 Last Saturday, Timothy Bradley beat the “Bam” out of Brandon Rios and won via ninth round stoppage. On the way to victory, Bradley dominated–totally dominated. The fight plan crafted by Atlas was superior. Use superior hand speed, quickness of foot, and voracious body punching to dismantle Brandon Rios who lost only twice prior to Saturday’s bout, both losses via decision. Pacquiao couldn’t stop him, didn’t even come close. Mike Alvarado couldn’t stop him. But the supposed light punching Bradley stopped him making it the first time Rios ever lost by KO/TKO. Some pundits would claim that Rios was primed to be stopped. He hadn’t fought in eight months, blew up in weight and had to dehydrate himself to make weight, and just didn’t have the usual Rios rage in the ring. All valid points, but the main cause for the stoppage was not attributable to the aforementioned. It was Teddy. Teddy chastised Timmy between rounds even though Timmy was dominating. And Timmy was eating it up with a spoon. He loved it. Couldn’t get enough. When Teddy gave one of the all-time best speeches between rounds, Bradley said, “Let’s go.” You would think he was behind in the fight, not winning every round. Teddy had Timmy in the gym for only seven weeks, and he’s done a complete makeover on Timmy. The first major improvement was in the defense. The great trainer, James Ali Bashir, said the objective in boxing is to hit and not get hit. Teddy clearly imparted that to Timmy. Timmy likes to got to war. He has a lot of Evander “Real Deal” Holyfield in him. Teddy was able to get Timmy to resist the urge to go to war. Timmy is not a sensitive type like Teddy’s former fighter Michael Moorer. Moorer was an extraordinarily talented boxer but a sensitive type of guy. Sensitive and Teddy don’t mix. Tough and Teddy mix. And mixes well. Timmy is tough. Timmy is made for Teddy. All of the above fighters are all-time greats who had an extra gear that was activated by their respective trainers. Timmy might get Manny. Timmy might even get Floyd. Pre-Teddy, no one would bet a plug nickel on Bradley beating them. But now, that’s changed. It’s changed because of Teddy. Timmy and Teddy may do some great things before it’s all over. One thing is for sure, no fighter has an edge in the corner over Bradley. And it’s the corner where many fights are won.